At the last second, I was able to head into GW for a game, and thus got to play guard vs nids, this time I was guard..
OK, having brought up the choice with Orbital101, 10 man Veteran squad, or Chimera/Rhino, he picked Chimera. Which means tonite i will assemble the prototype Chimera/Rhino and post pics, then get to work painting it green and yellow.. wish me luck. Wow, pure awesome-sause!. But really what grabbed me was the way they incorporated Universal Special rules and Scenario Objectives. 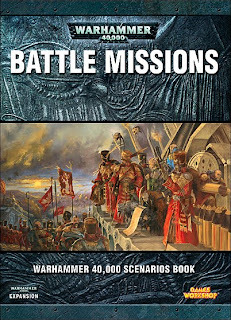 The simple reason is that this Battle Missions book will work with ANY version of 40k; past, present and future. The layout allows the players to randomly roll, generate based on a story, or just pick the ones they like. There are no specific 5th Ed. rules, so the longevity of the book itself is a great reason to buy it. We plan to incorporate the Battle Missions into Friday Night Fights - so expect some commentary and battle reports using this new resource. Instead of reviewing each scenario, I feel we would be better off reviewing them as we play them - so stay tuned! After watching a show on the history channel about the battle of the buldge I've decided it's time to turn my Leman Russ tanks to chaos, I have 2 Leman russ Battle tanks and 2 Leman russ Vanquisher tanks that i'm about to start turning to chaos. 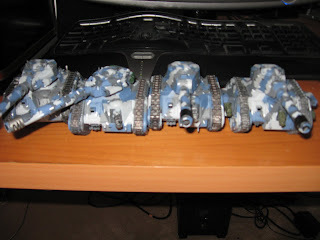 I'm going to try going back to my russes because im finding the medusas are just to fragile, I will still use them but want to try a few games with the less cost efficent but much better armoured Leman Russ. Here are the before pictures of the 4 tanks i will start to charge to chaos. after finishing a squad, and playing on friday, I need to finish painting the wsywyg stuff, so instead of finishing teh colossus for this week, im taking some guys to Quebec city and work on them at night at hotel. Another round of fights. I lowered the resolution in the hopes of making the files smaller so they aren't 300mb each and don't take 90 minutes per upload. Sadly, I think it is the framerate as they are still the same size. Which means I'll UP the resolution next time, since it doesnt make a difference! Also, I filmed after each player's turn this time, and more commentary at the end, so each VBR is split into 2 parts. I now plan to take a week or two and build the rest of my 1500pts to full WYSIWYG (along with all the vehicles), then continue painting each unit as I go. Going to be building Wolf Guard for each Grey Hunter unit, Wolf standards, and either building or scrounging Wulfen models to use as "Mark of the Wulfen" dudes in my units. I also need to build a new unit of Skyclaws (LOVE THEM!) and maybe a Wolf Priest with jump pack to lead them, the options are endless, and I am stoked to build this army far beyond 1500pts for sure. I can easily see Space Wolves becoming a 2500 point army very quickly, with all the build option I want to have. With Joyous providing me with jump packs and Land Raider for the force, it will get there soon. On a side note, I am still working on my Demon Prince for my Emperors Children, and I will get a pic of it up once its completed - it is less than stellar looking as a WIP. Ok So it took me the full week, but the first 100 points is done!!! First of all, these are getting a new paint job in the new Stronghold Colors: Here is my next batch of stuff for the challenge: 140 pt Colossus Siege Mortar, and 65 pt infantry squad to repaint. That gives me 2 weeks, in which I will also finish adding all the special weapons to everyone (roughly 12 guys) thanks to Loth's bits, and some from Jo.